The weather is soooo beautiful today. I spotted this solo flower yesterday. It looks like it is almost saying, I can’t wait for spring arrive, I blooming today! Purists may shudder when they see that I allowed the sun to shine on the flower, typically you block it out, so there aren’t extremes in shadow and highlight. With this one I just said “bugger it”. I do it my way today. Sun is light and light is life. Without the sun, nothing exists, so she should be included. You can see the other buds popping out behind too in this little patch of barren grass. For me the lesson when I look at these flowers each spring, is how effortlessly everything happens. They trust the season will come and when it does they just blossom. They are not trying to control and force the seasons to come, the rain or sun. That’s what I try emulate when I am trying to control and will things along in my life. Stop. Relax. Trust and Allow. Thanks to everyone out there who visits and comments. I have had just over 20,000 views in just over 2 months. Amazing. I appreciate all of you and you inspire me with your posts and comments too. Thank you thank you thank you. It looks like it’s been painted – so beautiful. Awesome photo and an awesome time – The Spring…. also a big wow of your visitors .. amazing as you say – If I just have 80/100 I would be more than thrilled .. hehe.. Hope your day have been great!! Thanks Mariane. Hope your day was awesome too. All I know is I take pictures, I don’t worry about anything! If they look good great, if not trash it! Yours looks great! I spent the day loading and unloading mulch. Back to work tomorrow . Thanks. Almost time for mulching here too. I’m sure glad I don’t really know the purist rules of photography! This photo is lovely! The high contrast, high saturation is perfect here! Nice detail and composition, too! Thanks John, appreciate the comments. Congratulations on 20k visits in 2 months. That’s good going. 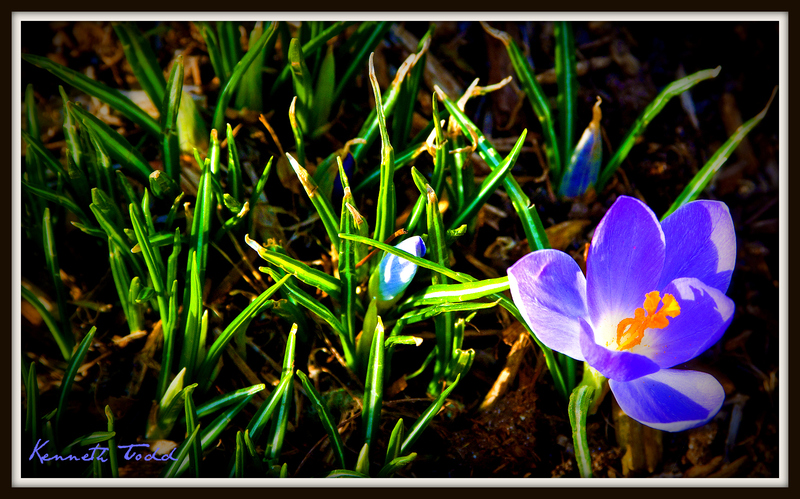 I love the crocus. Great colour and I agree with you – let the sun shine in your photos. It’s you that is the artist here and there is nothing to say you can’t do your own thing. Go for it. Thanks Kate. Appreciate the kind words and comments. Beautiful! I love the high contrast. Very well put. I, too, can’t wait. Pics like this are why I nominated you for a Kreativ Blogger on day 128 of my 365 day creativity challenge 🙂 Your pictures are awesome! The orange and purple contrast in the flower is gorgeous > especially with ‘the light’ that you didn’t block out! Congratulations on so many views on your page! That’s quite an accomplishment in itself. Nice composition. I like the shot! I like this one… the sun on the petals adds depth… nature’s lighting is sometimes the best. I don’t mind breaking rules when it comes to photography. Sometimes, the camera sees too much… or not enough… to really convey what my mind’s eye saw when I took the photograph… what my mood was. 20,000 views, well done! It is a true indication of the level of beauty your pics bring to our days and how much folks enjoy them. Thank you once again for sharing. Great photo! and I too am a fan of sunlight and trying to use it to my advantage.